Brand your company with attractive customized index tab dividers. Binding101 offers all styles of custom index tabs including options such as custom sheet sizes, tab shapes, premium full-color printing, colored Mylar™ on tabs, and more! Custom printed tab dividers add the finishing touch to your presentation, while also organizing your materials and allowing easy and quick access to information that is filed. Choose from some of our most popular options, (listed below) or create something that is uniquely yours, and yours alone! We offer a huge selection of paper stocks, printing options, tab coatings, bottom or side tab locations, punching, lamination, and so much more! Your imagination is truly the limit! 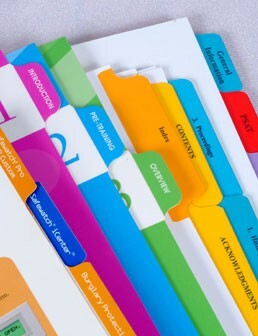 Basic printed tab dividers feature printing on the tab extension, either one or two sides. Clear or colored Mylar™ can be added for additional durability. This simple tab design is clean and provides clear labeling for your important internal documents, without the added fees of custom printed sheets. - Sheet Size: Letter size 11" x 8.5", Half size 8.5" x 5.5", Legal size 14" x 8.5", or any size of your choosing. - Paper Stock: 90#, 110# and 140# White or Ivory Index. Laminated add-on's also available. 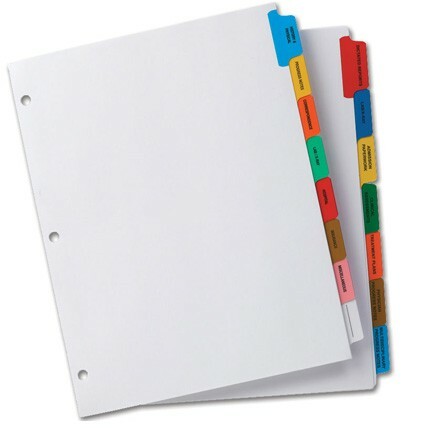 - Reinforcement: Clear and colored Mylar™ coating is available for the tab extension and binding edge. Many colors to choose from! - Extension: 1/2" is the standard size. - Punching: 2-Hole, 3-Hole and other punching options available. Custom hole patterns can be created to fit your exact needs. - Printing: Printing on the tab extension available on one or two-sides. - Typesetting: Standard is Helvetica Bold in either all-caps or standard, however, you can choose any standard font you choose for a more unique look. - Cut (Tab Size): Choose any cut (the number of tabs that can fit along the bank) to meet your exact needs. - Collation: Choose whether you want your tabs straight collated or uncollated. - Quantity: Minimum order of 50 sets. Price breaks available with larger quantities! Premium printed tab dividers (also known as four-color tabs or full-color tabs) feature printing from end to end with a full-bleed. This is the most popular method of customization because it offers customers the most versatility in design. You create the artwork and we will print them on these premium index tab dividers to create your one-of-a-kind look. Premium custom printed indexes will add the finishing touch to your high-quality (and impressive) presentation. - Paper Stock: 10 pt. or 12 pt. coated stock on 1 side or 2 side. Others available upon request. - Extension: 1/2" or 3/8" are standard sizes. 1/4", 5/8" and 3/4" also available. - Printing: One or two-side printing available. 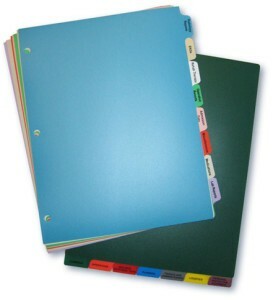 Fileback Dividers make the organization of large file folders much simpler and more efficient. 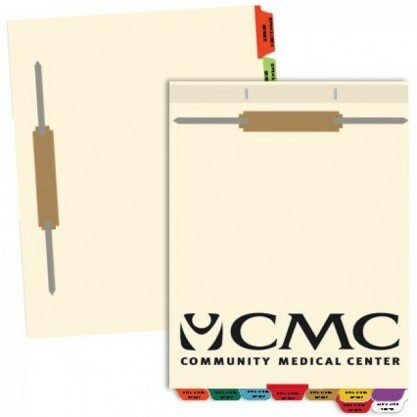 They are most commonly used in the medical industry to organize patient files. Individual fasteners are featured on each divider, enabling you to add or remove items from any section without disturbing information in other sections. This allows for a more efficient and accurate filing system. Fileback Dividers have several standard features, allowing you to pick and choose to coordinate with your current filing system. - Sheet Size: 13" x 8.5", 10" x 11", 12-5/8" x 8-7/8", 12-5/8" x 9" or 16" x 8-1/2"
- Paper Stock: 110# Ivory is standard, but 90# and 140# White or Ivory Index are available. - Reinforcement: Clear and colored Mylar™ coating is available for the tab extension. Many colors to choose from! - Extension: 3/8" or 1/2". - Punching: 2-Hole or 2-Slot for prong-fasteners. - Fasteners: Bonded fasteners available as an add-on. - Scoring: One Score line is standard. Two (1/4" apart) or three (1/4" apart) are also available. - Printing: Printing available on one or two-sides. Poly Index tabs are the perfect option when you are looking for tab dividers more durable than paper; they wont crack or tear with time. Poly materials are also environmentally friendly! They are easily wiped clean and are safe for clean-rooms, making them a popular choice for medical facilities. Many different thicknesses and colors are available to choose from -- plus, you can custom-print poly tabs to meet your exact needs. These tabs allow for durability at a cost effective price. - Poly Thickness: 15 Gauge and 23 gauge are the standard thicknesses for tabs. 35 gauge, 55 gauge and 75 gauge are also available. - Printing: Printing on the tab extension or body of the sheet available on one or two-sides.